Our bright and reflective Guardian Gear® Dog Safety Vests help keep pets safe by increasing their visibility during outdoor activities. Outer polyester shell with inner nylon layer. Quick release buckles on cotton straps. Two strips of reflective tape for added visibility. Vest can be adjusted at the neck, chest, belly and waist for a comfortable, streamlined fit. 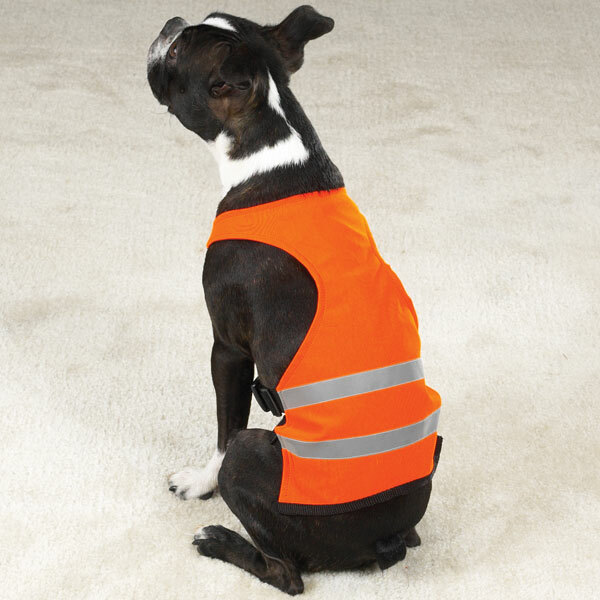 This dog safety vest is ideal for nighttime walks and exercise sessions. The bright fluorescent orange vest with reflective stripes ensures that your dog is visible. Great for hiking, running, walking, camping and other outdoor activities with your dog. Bright and Reflective Safety Vest - Orange Customer Photos - Send us your photo! I adopted Kodiak 2 years ago when he was picked up by the animal control officer. He was totally untrained & not even housebroken. He loves to please so, despite the breed, he was easy to train. He will do ANYTHING for food & love! The vest serves to make him visible to the hunters when we walk in the local woods. Lightweight, comfortable, ideal for his Service Dog vest. Houdini pretends to be a School Safety Guard - just needs a STOP sign. Great reflective vests for night time walking! I had to alter mine a tad but that was simple. Worth their weight in gold for safety. Vest is perfect for our Search & Rescue training ! I was able to spot her at dusk from quite a distance away. Without the vest, her coloring is too dark. I am ready to go for my walk during hunting season....? Posted On 11/19/17 by Farmington Hills from Farmington Hills, MI Yes, Farmington Hills recommends this product! The Bright and Reflective Safety Vest runs true-to-size and is of good quality. This is easy to put on your dog and is a must if you walk your dog early in the morning or later in the evening. Posted On 01/18/17 by Dana C from , NV Yes, Dana C recommends this product! We have been looking for caution orange reflective vests for some time. If we did find them the cost was crazy! I bought two, a large and a small, from Baxter Boo and they are Perfect! The shipping was fast and the ordering was easy. Doesn't get better than this! Thank you! Posted On 01/08/17 by Cindy from Kent, WA Yes, Cindy recommends this product! I really like this. I walk every day with my dog and I feel so much safer. Posted On 09/04/16 by Terry M from Lebanon, NH Yes, Terry M recommends this product! The quality and reflection is great. I needed to get a smaller size Reflective Vest. They are plenty big. Posted On 07/06/16 by Christine R from Ozark, AL Yes, Christine R recommends this product! Posted On 04/28/16 by Crystal L from Creighton, MO Yes, Crystal L recommends this product! This thing is huge, my dog is huge also, but this is the first thing that is almost to big for him. It also seems to be made very well, I shouldn't have to buy another one for a long time. Love it. Posted On 05/29/15 by Kim D from Steady Brook , canada, Yes, Kim D recommends this product! This is a great product , well made but unfortunately I ordered one that was a little to large. The back strap goes just before the back legs so important to order the correct size. A smaller one can fit but larger one not so much. Ihave a golden doodle that is 60 lbs and ordered x- large , but large would be better. Posted On 05/27/15 by Tina H from Rome, GA Yes, Tina H recommends this product! I ordered a 2X large for my 90 lb, very muscular, Doberman to use in the evening/night and during deer hunting season in the woods. I ordered up one size because the last one I bought (different style) was a little snug after washing. I needn't have worried. These run a bit big. The 2X would easily fit a St. Bernard or Newfoundland. It's enormous. The vest also runs long from head to tail. Not a particular problem unless your dog is short-bodied. It's just something worth mentioning. Easy to get on and off. The large one I got for my 70 lb Dutch Shepherd fits my Dobe so I imagine a medium will fit the Shepard fine. Posted On 04/27/15 by Deborah S from Waukesha, WI Yes, Deborah S recommends this product! This is the best safety vest! It's very well made, lined, and love the harness fit!! My Golden Retriever well be very visable while walking and in the evening!!! Great item! Best ever ! Posted On 03/07/15 by Zima G from Brooksville, FL Yes, Zima G recommends this product! This vest is well maded and it really helps on night walks ! Even in the daylight , it helps drivers know my service dog is on the street "side", and needs room to cross over. Love it! Posted On 11/08/13 by Becky T from Christmas Valley, OR Yes, Becky T recommends this product! We have a few of these, great for summer time.